Young adult men in their late teens and early twenties are statistically the least happy of any group of males surveyed. What’s more, scholarly research tells us that adolescent boys and young men have the highest rates of behavioral problems, completed suicides, and drug and alcohol problems of any demographic group. They also tend to have greater problems managing their emotions and successfully negotiating close interpersonal relationships, which makes therapy more complex and challenging. 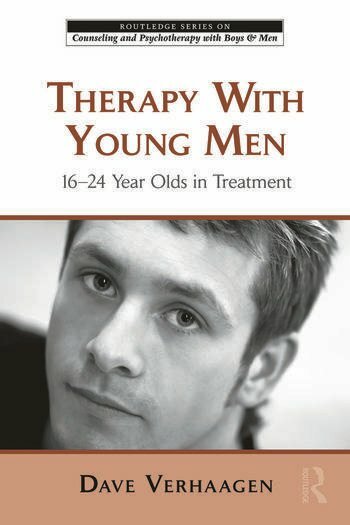 However, when done well, therapy with young men can be highly effective and quite rewarding for both the therapist and client. In Therapy With Young Men, Verhaagen presents a comprehensive model of therapy with young men that addresses each of these concerns, beginning with the rapport and engagement process, and then moving to ways to increase motivation for changing problem behaviors and increasing adaptive skills. The book describes a wide range of novel, effective cognitive-behavioral interventions that can readily be employed in the therapeutic process. The Culture of Young Men. What’s Going on Developmentally? Are Men and Women Different? Qualities of Great Therapists. Prelude to Therapy. The Tone of Therapy. Creating a Context of Change. Guiding Principles of Therapy with Young Men. Beginning Therapy. Going Deeper. Helping Identity Formation. Improving Emotional Intelligence. Working on Behavioral and Substance Problems. Improving Relationship Skills. David Verhaagen, PhD, ABPP, is a licensed psychologist and managing partner/CEO of Southeast Psychological Services. He is a well-published author and a frequent speaker; he is also one of fewer than 100 psychologists in the US to be board-certified by the American Board of Professional Psychology (ABPP) in Clinical Child and Adolescent Psychology.